The implementation of the concept of “Just Culture” is now widely seen as key for further improvement of aviation safety through more and better reporting of aviation occurrences. 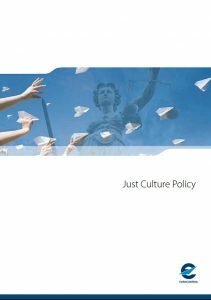 An essential condition for establishing a “Just Culture” at national level is an enhanced cooperation and coordination between safety and judicial authorities. In November 2016 Martin Bromiley spoke in Lisbon at the EUROCONTROL ‘Just Culture’ conference to over 150 people, including Air Traffic Controllers, Pilots, Judges, Lawyers and Prosecutors. The conversations were fascinating and he wanted to share their model ‘Just Culture’ Policy. relative to the development of this policy.